If this had happened during the days of Robert Stack and Unsolved Mysteries, we might have a resolution this particular case. After all, the UCLA campus is a large campus with lots of people, and it’s in one of the largest cities in the world other than New York, so there are potentially hundreds or thousands of witnesses to any one person’s activities. And yet, 18 years later, a disappearance case has gone completely cold and the victim is presumed dead, even without a body. Bruinland has been able to keep quiet the case of one of its freshman students, who disappeared from his dorm room in the early-morning hours of a day in December 1999 following a dorm party. And yes, we mean disappeared in that his wallet, keys, and shoes were left behind in his dorm room, untouched. 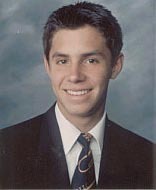 After a night of partying and playing some video games (this was the late 1990s, so it was not the video games we’re used to) with a friend, Michael Negrete gave a couple high-fives, entered his dorm room at about 4 a. m. and was not seen or heard from again. It was as if he walked right into a Sliders wormhole and didn’t have the remote to get back from the alternate universe. Negrete was on a music scholarship, a good student and had no history of anything like depression, drugs or gambling. All reports were that he was well-adjusted and friendly. His roommate made the missing person report that morning, and a police dog was able to track Negrete’s scent to a bus station a few miles away – which was curious since he had no keys to drive a car and had no shoes to be able to walk very far. The trail went cold there. There was a report of a white male in his mid-30s who was in Negrete’s dormitory the night of the party, who was reportedly wearing a shiny gray jacket. There should have been a general curiosity about a man in his 30s in a college dorm during a party wearing a jacket that could easily have been from the 1970s. However, police investigators were never able to find him, despite a piece of surveillance video that seemed to capture him, and a composite sketch by the Los Angeles County Sheriff’s Office that was distributed. What is even more mysterious is that in the last 17 years, there has been no activity on any bank accounts and there has not been contact from Michael to his family or friends. And yet, so far nobody has turned up. And there has been no physical evidence, zero witnesses, no DNA, nothing on security cameras, and he disappeared from a dorm room in a dorm building with hundreds of college students. It’s hard to imagine college students all being drunk and/or asleep at the same time. Someone had to have heard, seen, smelled or know something. And yet we are here almost two decades later with just as many questions as before as to the whereabouts of Michael Negrete. Previous Previous post: The Blair Bewitching Project? Next Next post: Should We Take Another Look At the Rosenberg Espionage Trial?